What does membership of the Institute of Export & International Trade mean? The Russian Federation is the worldâ&#x20AC;&#x2122;s largest country. It is almost 9,000 km (5,600 miles) east-west, and almost 4,000 km (2,500 miles) north-south. Russia covers one seventh of the worldâ&#x20AC;&#x2122;s land mass and spans eleven time zones. As it is so large, Russia has abundant natural resources, plus an economy encompassing modern infrastructure, high-tech production and a diverse range of industries, supplemented by state-supported business incentives. Despite having the smallest population of all the BRIC (Brazil, Russia, India and China) economies, in per-capita terms Russia is the wealthiest. However, its domestic supply of consumer goods and services in many sectors is still underdeveloped. There are opportunities for UK business in various sectors including advanced engineering, biotechnology and pharmaceuticals, consumer goods, education, energy, experience economy, financial and legal, mining, and telecommunications. Russia has a large and growing middle class of discerning consumers who have respect for UK-made brands, as well as a young and well-educated workforce and a growing number of small and mid-sized businesses. Despite the challenges of distance and climate, it also has good transport links and logistics with other markets in the Commonwealth of Independent States (CIS). Welcome from Lesley Batchelor OBE, FIEx (Grad) – Director General, Institute of Export & International Trade This Doing Business in Russia Guide introduces you to the largest country on earth and a market that has been surprisingly overlooked by many British businesses. Since the collapse of the Soviet Union and the subsequent economic difficulties of the late 1990s, Russia has regenerated its economy using its vast natural resources, especially its oil and gas. Now ranked 31st in the World Bank’s Doing Business Rankings and named as one of the emerging BRIC markets of the early 21st century, Russia certainly has a pro-business agenda these days. A member of the Asia-Pacific Economic Cooperation and the Eurasian Economic Union, Russia spans 11 time-zones from the east of Europe to the North Pacific Ocean, neighbouring Azerbaijan, Belarus, China, Estonia, Georgia, Kazakhstan, North Korea, Latvia, Lithuania, Mongolia, Norway, Poland, and Ukraine. With a 144 million population and a rising average income, there are undoubtedly many export opportunities across this huge country. Latest figures show that in 2016 the UK exported £5.3 billion goods and services to Russia, making it our 27th largest export market according to figures from ONS in 2016. Yet, there is strong respect for ‘UK made’ brands, a young and educated workforce, an increasing number of SMEs, and an appealing access to supply chains in neighbouring countries for the UK’s exporters to tap into. There was a remarkable 75% increase of goods and services exports between 2009 and 2012. According to a report from the Department for International Trade, there are plenty of opportunities for this relative export boom to continue, particularly around several manufacturing sub-sectors; UK exports of management practices, production processes, and manufacturing equipment could certainly flourish. At present, the top UK exports to Russia are engineering products, pharmaceuticals, chemicals, consumer goods and education. As with any new market there are challenges to be overcome and in Russia these include language barriers, differing regulatory requirements for different regions, and a lack of transparency in some business practices. We’d certainly recommend having a clear set of international terms and conditions covering anti-corruption laws and setting out clear routes to mediation and arbitration in cases of dispute – something we can help with through the International T&C templates that we offer to our members. Finally, you’ll need to familiarise yourself with a business culture and etiquette that is distinct from that of Western Europe. You will need to invest time and energy into your personal relationships and it’s vital that you build trust. Patience and punctuality at meetings is a must and don’t be put off if meetings are cancelled at short notice. Building relationships takes time and the first meeting will often be a ‘getting-to-know you’ affair. As the relationships develop, they will become more social in nature, but Russians are also hard-bargainers who appreciate strong arguments based on technical information and expertise. The Institute has run several training courses about exporting to Russia and we are on hand to help you navigate this massive market through our technical helpline and qualifications, so please do get in touch. I am delighted to welcome you to this guide on doing business in Russia. The Institute of Export & International Trade is working with the British Government to help companies find new business opportunities globally and we look forward to helping you navigate the Russian market successfully. The political relationship between Russia and the UK remains complex. Some areas of business are affected by EU and US sanctions. Companies operating in Russia need to understand the political and operational risks, and to comply with sanctions, but there is business to be done in Russia. UK-Russia bilateral trade is worth almost ÂŁ12 billion per annum. Key sectors include oil, gas and mining, advanced engineering, pharmaceuticals, green technology solutions, luxury goods and increasingly the service industries, and there are new investors. Astra Zeneca opened a manufacturing operation in the Kaluga region in 2015 which has continued to grow and expand, and an increasing number of UK companies are considering the opportunities of Russia as a manufacturing base. Shell's relationship with Russia goes back 125 years, and BP is currently the largest UK investor in Russia. I hope that my team in Moscow can join the IOE&IT in supporting you to develop your business in Russia. This is a demanding and complex market, but one where opportunities exist for the right sectors and products. The increased number of visitors to Russia during last yearâ&#x20AC;&#x2122;s World Cup has played its part in growing business interest in the Russian market from British companies. This builds on a strong and long-standing trading relationship across a range of sectors aligned to a number of UK sector strengths. The political relationship between our countries is undoubtedly challenging, but business-to-business links remain good, with Russian businesses well versed in the advantages of doing business with UK companies. The knowledge of English amongst many business people also means they often look to the UK for products and partners. This is borne out by the number of UK companies (over 4,000), with the right mix of quality, price and brand, successfully selling into the market, whether via partners, distributors, or by establishing a presence here. Understanding the business culture and building relationships are important the world over and Russia is no exception. Regular face-to-face contact is easily manageable with the main commercial centres of Moscow and St Petersburg being under four hours flying time from the UK. Looking further afield, major cities like Ekaterinburg, Rostov-on-Don, Nizhny Novgorod, Kazan and Novosibirsk are but a few of the cities to offer opportunities for UK companies. My team and I are ready to support UK companies to uncover and secure these opportunities, offering all-important advice and guidance along the way. We cover sectors including oil, gas and mining, advanced engineering, retail, creative industries, food and drink, and healthcare, among others, and offer a range of services from market research, trade missions and event management. We look forward to helping you develop your business in this exciting market. Foreword from Alf Torrents, Executive Director of the Russo-British Chamber of Commerce In Russia, British brands have a reputation for quality. Russia is the single biggest market in terms of population in Europe with sophisticated consumers who value that quality. These factors make Russia an attractive export destination which can be overlooked by businesses. It may come as a surprise but of the BRICS (China aside), the UK exports more goods to Russia than it does to South Africa and is just behind India. Myths about doing business in Russia persist. In the World Bank’s authoritative “Ease of Doing Business” index, Russia was placed 31st in 2018 – Spain was 30th and France 32nd – and Russia is placed above many other EU countries. In 2014 Russia was in 92nd place highlighting the positive reform that continues to transform the Russian business environment. As with any export market there are challenges but in Russia these are much less than imagined. The business language is English and you won’t be alone – there are over 4,000 UK VAT-registered companies doing business with Russia representing a commercial relationship worth over £10 billion. Which sectors do well in Russia? Cars, chemical products and machinery constitute the bulk of goods exported to Russia although goods from practically every sector are present to varying degrees. Unsurprisingly, given the UK’s reputation, financial services dominate services exported to Russia with Fintech an area of particular interest. Consultancy, telecoms, computer and travel services also have a strong presence. For the many who have taken the time to export and engage in the Russian market, that investment has been well-rewarded. Shouldn’t you? The Russo-British Chamber of Commerce The Russo-British Chamber of Commerce (RBCC) was formed in 1916. As a bilateral chamber, we also have a Russia office located in Moscow with expert local staff on hand to help. We have unparalleled experience in helping British companies enter the Russian market. Over its 103-year history the RBCC has been a constant for business in the ever-changing nature of the political relationship. Our 2 offices in London and Moscow run a busy programme of business events that will help you better understand the market. Both offices boast extensive business networks which can be accessed for advice, contacts or introductions. The Chamber keeps in constant contact with both governments to ensure it always gives the most up to date advice. Russia is of course far more than just Moscow and St Petersburg and has 15 cities with populations of over 1 million. With its expert knowledge, the RBCC acts as a bridge between the UK and the Russian regions and runs regular business missions where many British companies have successfully invested or exported to. DIT is the British Government department that helps UK-based companies succeed in an increasingly global economy. DIT also helps overseas companies bring their high quality investment to the UKâ&#x20AC;&#x2122;s economy. DITâ&#x20AC;&#x2122;s range of expert services are tailored to the needs of individual businesses to maximise their international success. DIT provides companies with knowledge, advice and practical support. Through a range of unique services, including participation at selected tradeshows, outward trade missions and providing bespoke market intelligence, DIT can help you crack foreign markets and get to grips quickly with overseas regulations and business practice. WHO MADE SURE THE SHOW WENT ON FOR A THEATRE COMPANY IN THE MIDDLE EAST? Without support from UK Export Finance, White Light wouldn’t have been able to take on a major contract for a theme park in the Middle East. Working with their bank we were able to provide a government-backed guarantee. This freed up White Light’s working capital to take on the contract, which in turn boosted their revenues by over 20%. TO FIND OUT MORE VISIT GREAT.GOV.UK/GET-FINANCE AND DISCOVER THE EXPORTERS’ EDGE. Our mission is to ensure that no viable UK export fails for lack of finance or insurance from the private sector, while operating at no net cost to the taxpayer. We help UK companies of all sizes and in all sectors win, fulfil and get paid for export contracts. We provide insurance to exporters and guarantees to banks to share the risks of providing export finance. In addition, we can make loans to overseas buyers of goods and services from the UK. As the world's first export credit agency, established in 1919, we've been innovating since day one. Last year, we provided ÂŁ2.5 billion of support for UK exports, helping 191 companies sell to 75 markets around the world. 77% of all companies we supported were small to medium-sized businesses. We also lent ÂŁ666 million directly to overseas buyers to help them buy from the UK - more than double the amount for 2016 to 2017. During the last ten years IMA has worked with the British Government's overseas trade and investment department, the Department for International Trade (DIT) [formerly UK Trade & Investment (UKTI)], and has written, designed, produced, launched and distributed over one million copies of more than 100 countryspecific print and multi-media based reports, guides and publications, including the internationally-recognised ‘Doing Business Guide’ series of trade publications. These are composed of market and industry sector-specific, multi-format print and digital trade reports, together with some of the internet’s most visited international trade websites - all of which are designed to advise and assist UK companies looking to trade with and invest in overseas markets. These reports and guides are then distributed free-ofcharge through the IMA and DIT global networks - over 500 distribution outlets in total. Further distribution takes place at global exhibitions, roadshows, conferences and trade missions, and IMA receives daily requests for additional copies of the guides from these networks and from businesses considering exporting. Each of IMA’s 'Doing Business Guides’ is produced in three formats: a full colour, glossy, paper-based brochure; a supporting fully-interactive and updatable multi-media based website; and the website contents available as a free-ofcharge downloadable smartphone/ tablet app. The guides’ contents focus on the market in question, how to approach that market and the help and support available, and include informative market overviews, plus details of business opportunities, listings with website links to British and Foreign Government support services and essential private sector serviceprovider profiles. 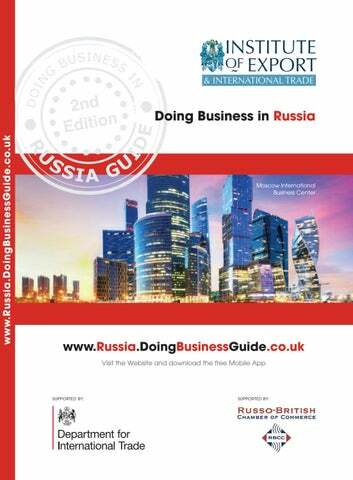 ‘Doing Business in Russia Guide’ published in the UK by International Market Advisor Ltd. © 2019 International Market Advisor Ltd (unless otherwise stated). All rights reserved. Contains public sector information licensed under the Open Government Licence v3.0. Spanning 11 time zones and extending across the whole of northern Asia and almost half of Europe – nearly halfway around the Northern Hemisphere – the Russian Federation is the world’s largest country. Economic overview Russia covers one seventh of the world’s land mass and spans eleven time zones. Due to its size, it has a wide range of climates, including sub-tropical in the south, and permafrost in the far north. This has resulted in varying levels of development and diﬀering social and economic factors. As it is so large, Russia has abundant natural resources, plus an economy encompassing modern infrastructure, high-tech production and a diverse range of industries, supplemented by state-supported business incentives. To help create a favourable business environment, the Russian Government has been taking measures to reduce the administrative burden on investors and entrepreneurs, including the process of regulatory reform which is still taking place at both federal level and in the regions. Despite having the smallest population of all the BRIC (Brazil, Russia, India and China) economies, in per-capita terms Russia is the wealthiest. However, its domestic supply of consumer goods and services in many sectors is still underdeveloped. It does, however, have a large and growing middle class of discerning consumers who have respect for UK-made brands, as well as a young and well-educated workforce and a growing number of small and mid-sized businesses. Despite the challenges of distance and climate, it also has good transport links and logistics with other markets in the Commonwealth of Independent States (CIS). More information on the CIS can be found at: http://www.cisstat.com/eng/cis.htm. Economic growth According to its latest World Economic Outlook report, the IMF has raised its projections for Russian economic growth for 2019 from 1.5% to 1.8%. See: https:// www.imf.org/en/Countries/RUS#ataglance. According to the report, the current changes in projections for Russia are largely due to higher oil prices and recovering domestic demand and that priority areas include improving governance and property rights, reforming labour markets, enhancing the institutional infrastructure and investing in innovation and infrastructure, to ensure further economic growth. Some bilateral co-operation and trade support activity has been aﬀected following Russia’s interventions in Ukraine and the illegal annexation of Crimea, as well as accusations of Russian involvement in the 2018 Skripal poisoning. The European Union’s (EU) restrictive measures have been targeted (see: https://www.gov.uk/government/news/ doing-business-in-russia-and-ukrainesanctions-latest), yet outside of those speciﬁc areas there remains signiﬁcant opportunities for UK companies. Beneﬁts for UK businesses exporting to Russia Russians have a high level of respect for UKmanufactured luxury retail brands. However, some Russians are reluctant to purchase foreign goods or services; although they are aware that British export products are innovative and among the highest quality available. Taking part in overseas exhibitions is an effective way for you to test markets, attract customers, appoint agents or distributors and make sales. Business opportunities If you are a UK-registered company you can beneﬁt from a unique programme ‘Exporting is GREAT’, presenting real-time export opportunities that you can apply for online. This is part of the drive to signiﬁcantly increase the number of UK companies exporting. ‘Exporting is GREAT’ is part of the UK Government’s GREAT campaign, and presents live export opportunities to UK businesses across a range of media outlets and digital channels. Hundreds of these export opportunities, with a potential total value of more than £300 million, are hosted on: https://www.great.gov.uk/. Selling online overseas Use this service to help choose a suitable online marketplace to sell your products overseas. get emails from international buyers straight to your sales or business development teams; see relevant government-supported export development events where overseas buyers will be attending. Events and missions Taking part in overseas exhibitions is an eﬀective way for you to test markets, attract customers, appoint agents or distributors and make sales. DIT's Tradeshow Access Programme (TAP) provides grant support for eligible SMEs to attend trade shows overseas. Participation is usually as part of a group – a great advantage for inexperienced businesses – and is usually led by one of DIT's Accredited Trade Associations (ATOs). ATOs work with DIT to raise the proﬁle of UK groups and sectors at key exhibitions. The DIT calendar of events has some 400 core events and missions, and 1,000 opportunities across the Trade Access Programme and the English national regions. DIT Events Portal The DIT Events Portal provides a single calendar view of all DIT events and missions, and has been developed to provide you with more detailed information on each event in order to help you decide on the most appropriate event to attend. The calendar can be ﬁltered and searched by sector and/or market. There are also detailed events websites which include more information about each event, and also allow you to register for an event. The DIT Events Portal is your central hub for business and networking opportunities. Search for future events and missions, register online and network with fellow delegates. See: https://www.events.great.gov.uk/ehome /index.php?eventid=200183029&. To ﬁnd out more about commissioning any of these services, contact a DIT Export Adviser at: https://www.great.gov.uk/contact/ triage/location/ for a free consultation, or see further details at: https://www.gov.uk/ government/organisations/department-forinternational-trade/about-our-services. In-market support If you already export, and have decided Russia is part of your business strategy, you are advised to contact DIT at the British Embassy Moscow prior to your visit to discuss your objectives and what help you may need. See: https://www.gov.uk/world/organisations /department-for-international-trade-russia #contact-us. Enter the Open to Export Action Plan Competition for the chance to win £3,000 cash and further support towards your plans for international growth. Complete your plan using our online planning tool. They can provide a range of Russia-speciﬁc services for you, including the provision of market information, validated lists of agents/ potential partners, key market players or potential customers; establishing interest from such contacts; and arranging in-market appointments for you. In addition, they can also organise events for you to meet contacts in Russia, or to promote your company and your products/services. For further information about DIT services, see: https://www.gov.uk/government/ organisations/department-for-internationaltrade/about-our-services. The currency in Russia is the Russian Ruble (RUB). ATMs are common and credit and debit cards are widely used in major Russian cities. It is illegal to pay for general transactions with Dollars or Euros, but you can exchange them for Rubles at banks, hotels or airport exchange bureaux. Local laws and customs Passport checks Passports must be carried at all times. Police carry out random checks, and you can be ﬁned if you are unable to produce your passport when asked. Drugs Long prison sentences are normal for possession of even small quantities of drugs. Photography You can be arrested for photographing military establishments or sites of strategic importance such as airports. LGBT+ travellers Attitudes towards LGBT+ issues in Russia are generally less tolerant than in the UK, particularly in rural areas. Homosexuality is not illegal in Russia, however, Moscow Pride was banned for 100 years in 2012. The currency in Russia is the Russian Ruble (RUB). In 2018 Russia was ranked 45th out of 49 European countries for LGBT+ rights by ILGA-Europe. See: https://rainbow-europe. org/#8656/0/0 for further information about the situation in Russia. ATMs are common and credit and debit cards are widely used in major Russian cities, but ensure you advise your card provider that you are visiting Russia, to avoid it being blocked. For LGBT+ community advice and guidance visit: https://www.gov.uk/guidance/lesbiangay-bisexual-and-transgender-foreign-traveladvice before you travel. Religious activities Certain religious activities such as preaching and distributing religious literature are restricted, and some religious groups can be harassed by the authorities. You should take particular care not to become involved. IT Access to some internet sites can be unreliable, and you should be aware that there are restrictions in place on some social media platforms. Visit the Federal Service for Supervision of Communications, Information Technology and Mass Media at: http:// eng.rkn.gov.ru/ and the UK National Cyber Security Centre at: https://www.ncsc.gov.uk/ blog-post/avoid-scoring-cyber-securityown-goal-summer for more information. You can contact the emergency services by calling 112. Foreign visitors are not usually the targets of violent crime. However, tourists have been targeted by well-organised gangs in St Petersburg. Bogus police oﬃcers have harassed and robbed tourists. If you are stopped, always insist on seeing their identiﬁcation, and report harassment or crimes to the British Embassy. Demonstrations Although political demonstrations and rallies do sometimes occur in cities and towns across Russia, these usually have prior permission from the authorities. However, it is advisable to avoid unauthorised demonstrations, particularly as these can lead to violence. Even though not all rallies are publicised in advance, it is best to check local media for information, be vigilant, and avoid any demonstrations. Safety and security Crime Most visits to Russia are trouble-free, but petty crime such as mugging, pick-pocketing and theft in main tourist areas, railway concourses, and from vehicles and hotel rooms does exist. Look after your passport at all times, especially in major transport hubs and busy areas in airports. Oﬃcial-looking taxis may be unlicensed, so you should consider using taxi apps to ensure they are safe, or ask your hotel to get a taxi for you. Do not ﬂag down taxis or share with a stranger, and wherever possible agree the fare before getting into a taxi or check that the meter is working. Local travel Consular support can be severely limited in some parts of Russia such as the North Caucasus, due to security situations. The Russian authorities take a particularly strict attitude towards security and compliance with visa and registration rules, and shortterm travel restrictions can be applied at very short notice. Road travel To bring a vehicle into Russia you will need to declare it to customs at the point of entry, but it will not be liable for import taxes for one year. Due to the vast distances, heavy traﬃc in major cities and poor road conditions, travel can take a long time. Do not drive alone at night or sleep in your vehicle on the side of the road, and do not pick up hitchhikers. Road safety is poor, with high numbers of traﬃc accidents. Make sure you are vigilant when driving, try not to drive at night if possible and always take into account the weather conditions. In Russia it is against the law to drink and drive, with a zero tolerance policy in place. Be aware that it is common for motorists to be stopped by traﬃc police in order to carry out spot checks. For information and advice on driving in Russia and compulsory documentation and equipment, visit the AA and RAC sites at: https://www.theaa.com/european-break down-cover/driving-in-europe/country-bycountry and https://www.rac.co.uk/drive/ travel/country/russia/. Rail travel Railway stations in Russia have airport-style security with checking of bags and passengers. If you are in a sleeping compartment make sure that it is always secure and do not leave it unoccupied. Air travel The quantity of carry-on items permitted in hand-luggage is limited in Russia. Check details with your airline or visit the Federal Air Transport Agency site (in Russian) at: https://www.favt.ru/ before you travel. to Russia. This is an opportunity to assess any health risks speciﬁc to you or the country itself and will allow time for any necessary vaccinations. Visit the Russia-speciﬁc pages of the TravelHealthPro website at: https://travel healthpro.org.uk/country/186/russia for more information. You can also receive useful information, advice and guidance from the NHS via the FitForTravel website at https://www.ﬁtfortravel.nhs.uk/ destinations or the NHS Choices website at: https://www.nhs.uk/using-the-nhs/healthcareabroad/. Some medicines prescribed or purchased in the UK can be of an alternative legal status and regulations surrounding their usage may vary in other countries. If it is necessary for you to travel with either prescription or over-the-counter medication you should consult the National Travel Health Network and Centre (NaTHNaC) or TravelHealthPro at: https://travelhealthpro. org.uk/factsheet/43/medicines-abroad. Most prescription and over-the-counter medication can be brought into Russia if it is for your personal use, although you will need to bring a notarised Russian-language prescription in your name if your medication contains narcotic or psychoactive substances. FCO foreign travel advice If you are travelling to Russia for business, the Foreign & Commonwealth Oﬃce (FCO) website has travel advice to help you prepare for your visit overseas and to stay safe and secure while you are there. For up-to-the-minute advice please visit the Foreign Travel section pages on the gov.uk website: https://www.gov.uk/foreign-traveladvice/russia. Travel insurance You should ensure you have comprehensive travel and medical insurance before you travel. There are opportunities for UK business in various sectors including advanced engineering, biotechnology and pharmaceuticals, consumer goods, education, energy, experience economy, financial and legal, mining, and telecommunications. There are opportunities for UK business in various sectors including advanced engineering, biotechnology and pharmaceuticals, consumer goods, education, energy, experience economy, ﬁnancial and legal, mining, and telecommunications. Do not forget to check that your goods meet legal requirements for export, at the UK Export Control Joint Unit (ECJU) (formerly known as the Export Control Organisation) at: https://www.gov.uk/government/organisa tions/export-control-organisation. Biotechnology and pharmaceuticals sector The Russian pharmaceutical market is growing each year, and is already valued at over US $30 billion, and the Russian Pharma 2020 strategy plans to further increase innovative drug development and domestic manufacturing output. Visit the EU Council law site at: https://eurlex.europa.eu/homepage.html for a detailed list of equipment that is aﬀected. Electricity grids Rosseti (JSC Russian Grids), the largest electricity distribution and transmission grid company in Russia, is moving towards the application of new technologies such as automated control systems, smart grids and other systems to improve control and operation. There are a wide range of opportunities for UK companies in Russia’s oil and gas sector where sanctions do not apply, such as conventional oil and gas ﬁelds, downstream oil-reﬁning facilities and in the construction of LNG plants. Energy eﬃciency In all sectors of the Russian economy and the entire chain of energy use, there are major opportunities for improved energy eﬃciency, including energy generation, distribution and ﬁnal consumption. As Russian oil and gas companies are increasing their use of local equipment, UK manufacturers should consider alternative routes into the market such as establishing joint ventures (JVs) with Russian enterprises. For more information about Russia’s energy sector, contact the DIT team in Russia at: tradeinvestmentmoscow@fco.gov.uk. exploration or production in waters deeper than 150m in the oﬀshore area north of the Arctic Circle, and shale fracking. Nuclear power The Russian nuclear industry is a world leader, and its state atomic energy corporation, Rosatom, has orders for more than 80+ units, including from India, Iran, Egypt, Finland, Hungary, Turkey, China, Belarus, Czechia and Bangladesh. See: http://www.rosatom.ru/en/ for more information. There are opportunities for UK companies to establish a supply chain relationship with Rosatom and also in the decommissioning sector. Renewable energy There is increasing interest in Russia to partner with overseas companies in the wind, hydro and solar energy sectors, creating opportunities for UK businesses to supply equipment and expertise. The number of renewable energy projects is increasing since Russia ratiﬁed Renewable Energy Source Development Measures (RESDM), which are now opening-up the market to UK providers of both goods and services. In addition there are opportunities for UK amusement park designers for the design and ﬁt of theme parks, including an ethnographic park under open sky RUSSIA (educational theme park – Russia in miniature), three theme parks by DreamWorks and one by Universal Studios. domestic mining sector is highly consolidated, with many companies combining extraction with processing, particularly in metallurgy. Russia plans to increase state support for its metals and mining companies with additional ﬁnance, and ending some export duties on metals. For more information about Russia’s experience economy sector, contact the DIT team in Russia at: tradeinvestmentmoscow@fco.gov.uk. Opportunities for UK companies in this market exist in the supply of machinery, consultancy, and in environmental and social areas. For more information about Russia’s mining sector, contact the DIT team in Russia at: tradeinvestmentmoscow@fco.gov.uk. Telecommunications sector Russia is Europe’s largest market for mobile phones, and is growing as demand for innovative technologies and equipment is boosted by the government’s programme to improve communication services to remote regions and the development of Long Term Evolution (LTE). However, traditional telecommunications services will still be in demand for some time as the network of ﬁxed lines only covers about 28% of the population. There are opportunities for UK companies in LTE/4G hardware and technologies, technologies targeted at the development of value added services (VAS), and innovative broadcasting technologies. For more information about Russia’s telecommunications sector, contact the DIT team in Russia at: tradeinvestmentmoscow @fco.gov.uk. Russia is an extremely large country. Each state has its own cultural practices and preferences. Different regions will have different industry clusters. Therefore regional plans and good local research is necessary. Do you wish to buy from Russia, sell to Russia or both? Do you wish to establish your own company presence in Russia (for example direct sales, forming a distributorship, setting up a branch or a representative oﬃce)? Do you need to be involved in Russia at all? Do you see Russia as part of a wider plan including e.g. other East European or Central Asian markets, now or in the future? Can you carry out a detailed SWOT analysis of your company? Are your competitors already in Russia? If so, what are they doing? Can you carry out a detailed SWOT analysis of your competitors? What are the Unique Selling Points (USPs) of your product or service? Do you know if there is a market for your product or service in Russia? Do you know if you can be competitive in Russia? Do you have the time and resources to handle e.g. the demands of communication, travel, product delivery and after-sales service? Do you know how to secure payment for your products or service? Do you know where in Russia you should start? Do you know how to locate and screen potential partners, agents or distributors? Have you carried out any Russia-speciﬁc customer segmentation, and do you know how to best reach potential customers in-market? Start-up considerations Getting started in the Russian market UK companies can use a number of ways to get started in Russia, including online selling, direct exports and sales, forming an agreement with a distributor, forming a representative oﬃce, franchising or setting-up a branch in Russia of a foreign legal entity. You can avoid costly mistakes by seeking help and advice from a local lawyer, as the tax and legal obligations of each business structure can diﬀer. A list of local lawyers in Russia is available at: https://www.gov.uk/government /publications/russia-list-of-lawyers. Direct exports and sales Direct export means supplying your products/ services directly to the customer and involves you taking care of the logistics of marketing, selling, sending overseas and getting paid. You also have the option to use local representation, for example by using an agent, distributor or wholesaler. To help you to identify local representatives in Russia, contact a specialist trade adviser at the Department for International Trade (DIT) at: https://www.gov.uk/overseas-customersexport-opportunities. Online selling Internet penetration in Russia is uneven. Moscow and St. Petersburg have over 77% of internet penetration, with only around 50% in Russia’s small towns and villages. Cash-ondelivery (COD) is most common for physical goods, although the use of electronic payments is increasing. You need to be aware of the Russian Data Localization Law 2015 requiring Russian citizens’ personal data to be physically stored on servers in the Russian Federation. The Russian telecommunications watchdog Roskomnadzor checks for compliance. Visit: http://eng.rkn.gov.ru/ for more information. The Department for International Trade (DIT) can help you export your goods to Russia through the E-Exporting programme. Find out more at: https://www.gov.uk/guidance/ e-exporting. DIT has also negotiated listings at betterthan-commercial rates. See online marketplaces in Russia at: https://sellingonline-overseas.export.great.gov.uk/. Russian legislation gives foreign investors advantages to help provide stability and legal protection for their business in Russia. Be aware that there are likely to be differences in legal practice adopted by authorities and commercial courts across Russiaâ&#x20AC;&#x2122;s regions, so you should consider taking local advice. Establishing a local Russian presence The main options for establishing a local Russian presence include setting up a branch or a representative oﬃce, incorporating a new company or acquiring a stake in an existing company in Russia. This section, which was prepared by Linklaters, highlights some of the key legal issues which may be relevant in this context. For more information visit: www.linklaters.com. JSCs and LLCs is quite similar in that both enjoy substantial ﬂexibility in relation to corporate governance. A public joint stock company is, on the contrary, very heavily regulated. 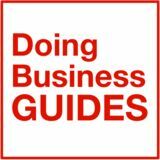 For more detailed guidance on the appropriate vehicle for establishing a commercial presence in Russia, please visit: http://russia.doingbusinessguide.co.uk/ media/1451933/Coming-to-Russia.pdf. Foreign ownership restrictions Foreign investors should be aware of the existence of speciﬁc foreign ownership restrictions in certain areas such as natural resources, banking, insurance, mass media, ﬁshing, agriculture and some other industries where restrictions on participation in equity capital by foreign legal entities or individuals and/or restrictions on participation in the management of Russian legal entities are imposed. during the last few years we have been witnessing a substantial shift towards a more frequent use of Russian onshore structures and Russian law in cross-border transactions involving Russian parties or assets. The direct or indirect acquisition of an existing Russian company will often be subject to a number of statutory consents: • Subject to certain ﬁnancial thresholds, the transaction may require Russian merger control clearance, which is in most cases suspensory (for more detail visit: http://russia.doingbusinessguide. co.uk/media/1451936/Russian-MergerControl-and-Foreign-InvestmentsRules.pdf). One of the key reasons for this is that Russian contract law is undergoing revolutionary reform speciﬁcally aimed at making it more ﬂexible and more suitable for use in large international transactions. As a result, most customary contractual protections can now be incorporated into Russian law governed instruments. In particular, Russian law now generally recognises warranties and indemnities, conditions precedent, options and es crow arrangements. Russian corporate law now allows for greater ﬂexibility in terms of corporate governance e.g. in relation to director appointment rights, veto matters, and requisite majorities which are important in establishing the respective rights of joint venture partners. Dispute resolution One of the key challenges in structuring Russian M&A and JV deals remains the possibility of submitting disputes to foreign arbitration (e.g. LCIA). The recent Russian arbitration reform has introduced a number of fairly onerous procedural formalities which do not technically prohibit, but may substantially impede, the choice of foreign arbitration for Russian share purchase and shareholders’ agreements. For more information regarding the recent Russian arbitration reform visit: http://russia.doingbusinessguide.co.uk /media/1451930/Arbitration_Reform.pdf. How to do business in Russia Legal considerations Russian legislation gives foreign investors advantages to help provide stability and legal protection for their business in Russia. The legislation has recently been updated. You should check with a legal expert to conﬁrm up-to-date details as these can change at short notice. You also need to be aware that there are likely to be diﬀerences in legal practice adopted by authorities and commercial courts across Russia’s regions, so you should consider taking local advice. Import restrictions The EAEU (Eurasian Economic Union) has a list of all EAEU-prohibited or restricted items and applicable regulations, at: http://www. eurasiancommission.org/en/act/trade/catr/n ontariﬀ/Pages/ediny_perechen.aspx. Law on marketing and selling If you are selling to consumers (rather than businesses) you must comply with Russia’s consumer protection requirements. Regulatory bodies The major registering authority for most legal entities operating in Russia is the State Chamber of Registration, a part of the Russian Ministry of Economic Development. Visit: http:// economy.gov.ru/en/home/about for further information. Good after-sales service is not common in Russia. However, you should be aware of guidance from the Russian Federal Service for Surveillance on Consumer Rights Protection and Human Wellbeing (Rospotrebnadzor), which has information related to marketing and selling. Visit: http://www.rospotrebnadzor .ru/en/ for further information. Depending on the type of business activity, you are likely to need a licence issued by an authorised licensing body. Licensing is carried out at both a federal and regional level so you will therefore need to seek approval from both state and relevant local bodies. Contact the Department for International Trade (DIT) team in Russia at: https://www. gov.uk/world/organisations/department-forinternational-trade-russia#contact-us for more information and advice on marketing in Russia. You are therefore advised to consult with an import agency or legal professional to gain expert local advice before you export to Russia. A list of potential lawyers in Russia is available at: https://www.gov.uk/government /publications/russia-list-of-lawyers. Standards and technical regulations It is important to check if your product requires any certiﬁcation before being sold in Russia. Suppliers and manufacturers have an obligation to make sure products are safe. Products must meet relevant safety standards, have clear instructions for proper use and include warnings against possible misuse. The quality certiﬁcation system in the Russian Federation is GOST, which is the equivalent of the ISO 9000 series certiﬁcates for Western companies. Visit: http://www.gost-r.info/ for further information. Taxation The Russian Federal Tax Service has responsibility for tax administration. For further information visit: https://www.nalog.ru/eng/1.html. You should hire qualiﬁed ﬁnance specialists to ensure you comply with regulations, meeting both International Accounting Standards (IAS) as well as Russian accounting standards. Double-taxation agreement The UK and Russia have signed a double taxation agreement, which allows some taxes paid in one country to be deducted in the other. See: www.gov.uk/government/ publications/russia-tax-treaties. Provided you get and keep evidence of your export, and comply with all other laws, you can zero-rate the sale of your goods to Russia. You will need to ensure the goods are exported, and provide evidence within three months from the time of sale. Special Economic Zones (SEZs) There are 28 SEZs, which grant certain tax, customs and other concessions to residents. To ﬁnd out more information about the SEZs, visit the Russian Ministry of Economic Development site at: http://economy.gov.ru /en/home/about. The DIT teams in Russia at: https://www.gov. uk/world/organisations/department-for-inter national-trade-russia#contact-us can help you ﬁnd tax advisers before entering into agreements in Russia. More information on GST in non-EU markets can be found at: https://www.gov.uk/guidance /vat-exports-dispatches-and-supplyinggoods-abroad. Excise duty You will need to pay excise duty on any alcohol, alcoholic drinks, energy products, electricity or tobacco products you send to Russia. Value Added Tax (VAT) VAT is 18%, with a preferential rate of 10% for certain items such as books, food, children’s clothing and medical goods. Further information on VAT in non-EU markets and zero rating conditions is available at: https://www.gov.uk/guidance/vat-exportsdispatches-and-supplying-goods-abroad. Income tax Non-residents are subject to personal income tax on Russian-generated income. The Russian Federal Customs Service regulates all goods imported into Russia. Visit http://eng.customs.ru/ for further details. You can calculate duty by percentage of customs value of goods imported, or by speciﬁc value (charged for one piece of the relevant goods category), or by a combined volume (a combination of the above). Company and corporate tax Proﬁts are taxed at a maximum of 20% on net income, and employers pay 30% of total payroll to the Social Insurance Fund, Russian Pension Fund and Medical Insurance Fund. aware that the import of certain goods will require a licence. All issues such as tariﬀs, tariﬀ rate quotas, technical regulations, licensing and certiﬁcation are currently being harmonised by the Eurasian Economic Union (EAEU). Visit: http://www.eaeunion.org/?lang=en for the latest details. You can ﬁnd out about import tariﬀs at the EU’s Market Access Database (MADB) has information about import tariﬀs. See: http://madb.europa.eu/madb/indexPubli.htm and a full list of trade barriers for Russia, visit: http://madb.europa.eu/madb/barriers_ result.htm?isSps=false&countries=RU. You must declare any goods that you take with you in your luggage to sell outside the EU. See: https://www.gov.uk/take-goods-sellabroad for further information. Temporary export of goods You can use an ATA (Admission Temporaire/ Temporary Admission) Carnet to simplify the customs procedures needed to temporarily take goods into Russia. Visit: https://www.gov. uk/taking-goods-out-uk-temporarily for further information. To apply for a temporary export licence, you will need to use the SPIRE system at: https://www.spire.trade.gov.uk/spire/fox/ espire/LOGIN/login. Complying with HMRC regulations to export To export your goods to Russia you must make export declarations to HMRC through the National Export System (NES). Visit: https://www.gov.uk/guidance/exportdeclarations-and-the-national-exportsystem-export-procedures for further details. Import requirements/documentation Every item imported into Russia requires a Customs Freight Declaration, supported where appropriate, by additional documents such as contracts, invoices, packing lists, certiﬁcates of origin/safety/conformity, permissions and licences etc. You can ﬁnd out how to declare your exports to Russia through the NES at: https://www. gov.uk/guidance/export-declarations-andthe-national-export-system-exportprocedures. You must classify your goods as part of the declaration, including a Commodity Code and a Customs Procedure Code (CPC). Commodity Codes and other details applying to exports in the UK Trade Tariﬀ can be found at: https://www.gov.uk/trade-tariﬀ. Contact the HMRC Tariﬀ Classiﬁcation Service at: https://www.gov.uk/guidance/ﬁndingcommodity-codes-for-imports-or-exports #list-of-useful-contacts for more help. Shipping your goods to Russia You can use a freight forwarder to move your goods if you are not knowledgeable about international shipping procedures. A freight forwarder will have vast expertise and familiarity with local documentation requirements, regulations, transportation costs and banking practices in Russia. The British International Freight Association (BIFA) at: http://www.bifa.org/home and the Freight Transport Association (FTA) at: http://www. fta.co.uk/ can assist in locating freight forwarders to transport your goods to Russia. Posting goods For information about sending goods by post to Russia, visit Royal Mail at: http://www.royalmail.com/russia. Russian Post, the postal system in Russia, has its own restrictions and prohibitions for international mailing of speciﬁc items. Visit: http://www.pochta.ru for further details. Shipping restricted, banned and dangerous goods Certain goods are classed as restricted or dangerous. If you wish to import any of these goods into Russia they are subject to special rules. For more information visit: https://www.gov.uk/shipping-dangerousgoods/what-are-dangerous-goods. You should seek advice on the latest import licensing requirements, or even consider employing a local agent who will have this knowledge. For information and assistance contact the Department for International Trade (DIT) team in Russia at: https://www. gov.uk/world/organisations/department-forinternational-trade-russia#contact-us. Establishing personal relationships is essential in conducting business in Russia. You should invest time and effort into creating rapport with your business partners. Register for free on www.opentoexport.com for updates on our content and webinars, and to start your Export Action Plan. Meeting and greeting Establishing personal relationships is essential in conducting business in Russia. You should invest time and eﬀort into creating rapport with your business partners, and be aware that as Russia is a conservative, hierarchical society it is considered important to create a good impression by dressing smartly. When meeting and greeting it is normal to shake hands with men although not expected with women, although this is becoming more common. Russians address each other by name and patronymic, but it is perfectly acceptable for foreigners to use ﬁrst names. Language An increasing number of Russian companies, particularly those with an international outlook, have English speakers on their staﬀ. Many of the younger generation – particularly in Moscow, St Petersburg and other large cities – can speak some English, but few do in more rural areas. When setting up an appointment, you should always ask if your contact speaks English or if they would feel more comfortable with an interpreter. Interpreters Your interpreter is one of your key assets, so needs to be chosen carefully. We recommend you use a professional interpreter for negotiations and avoid using electronic translation for your correspondence. Initial written approaches to Russian companies should always be in Russian, and your literature should be translated too. Lists of potential interpreters and translators can be found at: https://www.gov.uk/ government/publications/russia-list-oftranslators-and-interpreters. > Clear, consistent content is vital to making your business understood overseas. So don't leave it to chance. If you're reading this guide, the chances are you're either a seasoned exporter, or you're committed to investigating new export opportunities for your business. Whichever category you fall into, you'll have a good idea of the huge investment in time, effort and resources which is required for export success. Your priority will be to get your product or service to market, and it's a fact of life that procurement of peripheral resources such as translation is often left to the last minute. In this article we'd like to demonstrate to you how building translation into the early planning stages of your export campaigns can pay dividends. The internet, mobile connectivity and social media mean that now more than ever before customers, be they B2B or B2C, are buying goods and services within the context of a connected world of instant communication. Buying decisions carried out in isolation of wider and constantly changing sector, economic or social contexts are a thing of the past. This means that increasingly any product or service has to be supported with professional technical, marketing or other contextual content. As examples of this, exporters need their technical documentation to be easily assimilated, their marketing content to be compelling, and their website to be informative and memorable. Human resources departments on the other hand need sensitive localisation of policies & procedures in line with local legislation, corporate guidelines and house style. After all an international expansion strategy or company restructuring could easily be undermined by insensitive internal communication. The key words used to describe your company’s products, services and processes support your brand and identity. This is equally true in your foreign language communications. Unfortunately, once translated it is often easy to lose control of key terms, leading to uncertainty as to whether the translations are having the desired impact. AST’s terminology management prevents this. Glossaries are maintained in multiple languages and client terminology is checked in each language by industry sector experts. As the glossary grows it can be reused with each new project, so client content is always on-message and brand integrity consistent. So there’s really no need for you to leave the “softer” aspects of your export campaign to chance. Using a professional translation company like AST provides a guarantee that your international content will be clear, consistent and effective. Whatever the language. > YOU NEED YOUR SALES, TECHNICAL AND WEBSITE CONTENT TO BE TRANSLATED BY EXPERTS! No matter how urgent your assignment we can translate it. Ensure that your IP rights are protected by contacting a local lawyer who is specialised in Intellectual Property. Remember that it is easier and more cost-effective to prevent any issues by preparing correctly, rather than dealing with problems that arise later from a dispute. Protecting your Intellectual Property (IP) As a signatory to major international treaties on Intellectual Property rights, Russia’s legal provisions are mainly in line with international standards. IP rights are territorial, which means that they only give protection within the countries where they are registered. You should therefore consider registering your IP rights (if necessary) in Russia before entering the market. If you do not possess suﬃcient IP protection it may become very hard to trade in Russia and you could swiftly lose your place within the market. It is also crucial to have competent trademark registration and patent protection in place. These are covered by the Federal Service for Intellectual Property, Patents and Trademarks (Rospatent). Visit: http://www. rupto.ru/start?lang=en for further information. Ensure that your IP rights are protected by contacting a local lawyer who is specialised in Intellectual Property. Remember that it is easier and more cost-eﬀective to prevent any issues by preparing correctly rather than dealing with problems and legal issues that arise later from a dispute. A list of potential lawyers in Russia can be found at: https://www.gov.uk/government/publications /russia-list-of-lawyers. Information is provided on the UK Government’s Intellectual Property page at: https://www. gov.uk/intellectual-property-an-overview, and at the Intellectual Property Oﬃce – the UK Government agency providing free and impartial advice on protecting and registering your IP in the UK and abroad. See: https: //www.gov.uk/government/organisations/ intellectual-property-oﬃce. UK companies can use a number of ways to get started in Russia, including online selling, direct exports and sales, forming an agreement with a distributor, forming a representative office, franchising or setting-up a branch in Russia of a foreign legal entity. To most the Institute of Export & International Trade simply plods away providing much needed qualifications to professionalise the industry however, did you realise that our helpline is one of the busiest and best in the industry? It’s all part of membership and, if you need more than a phone call, we can put together a project to fulfil your needs. 2015 saw the launch of our Technical Help for Exporters that recognises the volume of legislation and regulation that covers our industry and gives you the comfort of knowing that if you don’t know, you know someone who does! the forums and Special Interest Groups, and those who attend our training courses or study with us, enables us to represent the industry at government levels in both the process and delivery of policy for international trade. These views also help us to ensure that the training programmes are effective and pertinent to the industry needs. Our Diploma in World Customs Compliance and Regulation is testament to the way we listen to our members’ needs. This was driven by Nissan, Adidas, John Lewis and many others and will neatly dovetail into any AEO work ensuring that quality standards are met at manager and junior staffing levels. Starting in 1935, the Institute committed itself to building competence and growing confidence for businesses trading in goods and services, which at the time, was a far reaching remit. Over the years this remit has seen us develop from simply providing training in short course format over a day, or perhaps two, into a fully-fledged Ofqual Awarding Organisation that operates specifically to deliver international trade education. our young people at an earlier stage. We need to engage the next generation in thinking about how world trade works and how it will be great for British businesses. They need to know how items arrive in the shops which, in turn, will begin to spark ideas. As these young people join companies they will bring a fresh outlook that all things are possible especially if you operate globally. This status allows our individual members and corporates alike to be sure that they are part of a quality organisation with plans for growth integrated with a sustainable future for the global prosperity of UKPlc. Why not call us and get involved? It has never been more important that we act as an industry to help â&#x20AC;&#x201C; we need experts and commitment to professionalising international trade from businesses large and small â&#x20AC;&#x201C; help your institute to stay ahead of the curve. Focusing on qualifications. A focus on qualifications - but why do we need them? I’d like to tell you about my story, it’s ok it won’t take too long but I think it’s similar to a lot of people that work in international trade. I left school with no ambition to do anything other than help my mum make ends meet. I wanted to be a seamstress but we couldn’t afford the material for the interview so I went into an accounts department at a large pharmaceutical company. Luckily for me they recognised a hard worker and asked me to work in various departments. After a year they asked me which one I like the best and without even thinking I said “international”, and that was my career set out for me. Working in international trade I found that I needed to understand so many different things - from how trade agreements impacted a sale to the legal aspects of trade and how different systems worked in terms of contract and disputes. Getting paid brought about a whole new set of issues and this really made me learn and think about the implications of offering credit and how it can be used to your advantage. Things I learnt about logistics and the paperwork that was needed to support a trade were empirical and slowly I became sure of my knowledge. The problem was, that when I wanted to move on to the next company, I had nothing to show I had that knowledge. It was frustrating to find that the knowledge that I had accumulated over 11 years wasn’t evidenced in any way and that no-one knew exactly what I knew. I was lucky enough to get my next job with a well-known Japanese computer company but it made me realise that if I wanted a career, I needed to get qualified. So I spent the next two years, two nights a week at night school honing my skills and building a knowledge and understanding of all aspects of the trade I had entered “by the back door”. Finally, exhausted but with a full understanding of how planning and control worked, I passed and became a Graduate Member of the Institute of Export & International Trade, suffix MIEx (Grad) in 1991. Well, many things have changed since then, as after many years of working in international trade, I took over at the helm, steering the qualifications and the Institute towards a better place. We have now gained Ofqual Awarding Organisation status for the qualifications and have worked hard on ensuring we are ready for the next 80 years of representing the industry and standing as guardian of professional standards in international trade. OFQUAL* awarding status is hard earned and we are proud to be the only professional body operating in this international trade environment. Young International Trader (Available electronically) International Trade Logistic Operations ** Certificate of International Trade Certified International Trade Adviser Advanced Certificate in International Trade Diploma in International Trade Diploma in World Customs Compliance and Regulations Foundation Degree jointly delivered with ***Anglia Ruskin University Higher Apprenticeship in International Trade - the first so far. Our courses at level 3 onwards are delivered online using a blended learning technique which involves the support of an expert tutor for each topic. The IOE&IT online campus offers a range of learning tools, from power-point presentations and videos to online chats and forums for the students. The Institute has a success rate of 95% in helping our students through these academic programmes. a. International Physical Distribution b. Selling Services, Skills and Software Overseas c. Or one of: i.
eBusiness internationally was launched in summer 2016.
www.export.org.uk/page/qualifications will give you more detail and a contact who will talk you through your options. The British Embassy Moscow maintain and develop relations between the UK and Russia. They provide services to British nationals living in and visiting Russia The British Embassy Moscow help bilateral political relations between UK and Russia and work closely with the Russian Government to address international issues of concern. They support British exports to, and investment in, Russia, providing a wide range of services to both British and Russian businesses. They encourage a low-carbon, high growth global economy, support world-class science and innovation collaboration between the UK and Russia, as well as links between the armed forces in both countries. Find out more on their UK and Russia news page, here: https://www.gov.uk/world/russia /news. The British Embassy Moscow provides services to British nationals living in and visiting Russia. You can access UK Government services while in Russia, here: https://www.gov.uk/world/russia. or replacement passport in time to travel, here: https://www.gov.uk/emergencytravel-document. If the person needing the emergency travel document is under 16, a parent or guardian should apply on their behalf. If you are due to travel in the next 24 hours, contact the British Embassy Moscow as soon as possible, here: https://www.gov.uk/world/organisations /british-embassy-moscow#contact-us. If you are travelling in more than 3 weeks, check if you can get a new or replacement passport in time to travel, here: https://www.gov.uk/renew-adultpassport. If you arrived in Russia on a Russian visa, its replacement must be obtained via visa sponsor in order to leave Russia. If you apply for an ETD because your passport has been lost or stolen, you will be expected to produce a Police report when applying for an exit visa from Russian authorities. If you are not a British citizen or have not had a British passport before If you are not sure, check if you are a British citizen, here: https://www.gov.uk/ check-british-citizen. If you are not a British citizen but think you may be eligible, contact the British Embassy Moscow to apply for an emergency travel document, here: https://www.gov.uk/world/organisations /british-embassy-moscow#contact-us. Other consular services Notarial and documentary services See the full list of notarial and documentary services the British Embassy Moscow provide, here: https://www.gov.uk/ guidance/notarial-and-documentaryservices-guide-for-russia. Consular fees The British Embassy Moscow charge fees for some of their services. See the full list of consular fees in Russia, here: https:// www.gov.uk/government/publications/ russia-consular-fees. They also provide services in Ekaterinburg, see: https://www.gov.uk/world/ organisations/british-consulate-generalekaterinburg. All consular services are by appointment only. Book your appointment online: https://www.consular-appointments. service.gov.uk/fco#!/british-embassymoscow/-/service_list. ABOUT US Launched in 2007, Start Up Overseas has become the deﬁnitive online resource for companies who are looking to expand internationally, export products or set up overseas operations. We have all the information you will need to trade in 60 countries. LOOkinG FOR heLP dOinG BUSineSS in RUSSiA? You are not alone. In January 2017, 29,064 companies used Start Up Overseas to ﬁnd up to date information – and to ﬁnd service providers who could help. country Guides – the essential information you will need to trade on foreign soil. Business directory – A helpful directory giving you the tools and contacts to run your business overseas. Start Up Overseas Forum – Join our virtual community. Share knowledge & advice with people facing similar issues to you. editors news – Subscribe to our free newsletter, and keep completely up to date with all the developments in international trade. UK Export Finance UK Export Finance is the UK’s export credit agency and is the operating name of the Export Credits Guarantee Department (ECGD). UKEF’s mission is to ensure that no viable UK export fails for lack of finance or insurance from the private sector, while operating at no net cost to the taxpayer. We help UK companies of all sizes and in all sectors win, fulfil and get paid for export contracts. We provide insurance to exporters and guarantees to banks to share the risks of providing export finance. In addition, we can make loans to overseas buyers of goods and services from the UK. Last year, we provided £2.5 billion of support for UK exports, helping 191 companies sell to 75 markets around the world. 77% of all companies we supported were small to medium-sized businesses. We also lent £666 million directly to overseas buyers to help them buy from the UK - more than double the amount for 2016 to 2017. A trade show is a method of promoting a business through the exhibition of goods and services, an organised exhibition of products, based on a central theme, where manufacturers meet to show their products to potential buyers. Taking part in overseas exhibitions is an effective way for you to test markets, attract customers, appoint agents or distributors and make sales. DIT's Tradeshow Access Programme (TAP) provides grant support for eligible SME firms to attend trade shows overseas. Participation is usually as part of a group, a great advantage for inexperienced businesses, and is usually led by one of DIT's Accredited Trade Associations (ATOs). ATOs work with DIT to raise the profile of UK groups and sectors at key exhibitions. For more information visit: https://www.gov.uk/tradeshow-access-programme. Disclaimer Whereas every effort has been made to ensure that the information given in this Guide is accurate, neither International Market Advisor (IMA), the Institute of Export & International Trade (IOE&IT), the British Embassy Moscow, the Russo-British Chamber of Commerce (RBCC), UK Export Finance (UKEF), Department for International Trade (DIT), or the Foreign & Commonwealth Office (FCO), accept liability for any errors, omissions or misleading statements and no warranty is given or responsibility accepted as to the standing of any individual, firm, company or other organisation mentioned. The purpose of the Doing Business Guides, prepared by International Market Advisor (IMA) is to provide information to help recipients form their own judgments about making business decisions as to whether to invest or operate in a particular country. In particular, none of the report's contents should be construed as advice or solicitation to purchase or sell securities, commodities or any other form of financial instrument. No liability is accepted by IMA, IOE&IT, the British Embassy Moscow, the Russo-British Chamber of Commerce (RBCC), UKEF, DIT, or the FCO for any loss or damage (whether consequential or otherwise) which may arise out of or in connection with the report. No warranty is given, or responsibility accepted as to the standing of any individual, firm, company or other organisation mentioned. The report's contents were believed (at the time that the report was prepared) to be reliable, but no representations or warranties, express or implied, are made or given by IMA, the IOE&IT, the British Embassy Moscow, the Russo-British Chamber of Commerce (RBCC), UKEF, DIT or the Foreign and Commonwealth Office (FCO) as to the accuracy of the report, its completeness or its suitability for any purpose.